The Mo’s Ferry Prod. history shows quite a list of releases so far. The label itself and the productions of artists such as Dapayk & Padberg, Mossa or Luka & Lazo stand for a fresh and edgy sound within the club music scene. And you get a similar picture by looking up the various remix producers the label has chosen. Their work has definitely expanded the musical spectrum – once more into minimal tool techno (Barem, Pan-Pot), another time more towards a vanguard kind of sound (Noze, Krause Duo). 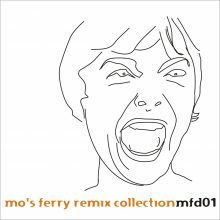 The „Mo’s Ferry Remix Collection“ presents a cross section over the last years. In addition to recently released tracks you’ll also find a couple of early productions on the label and one previously unreleased remix by Troy Pierce.